In order to be able to skin, you need a couple of programs and a plug-in. 1. First, you need GCFScape (download at "http://nemesis.thewavelength.net/index.php?p=26"), which is just an unpacker for Valve's .gcf files. 2. 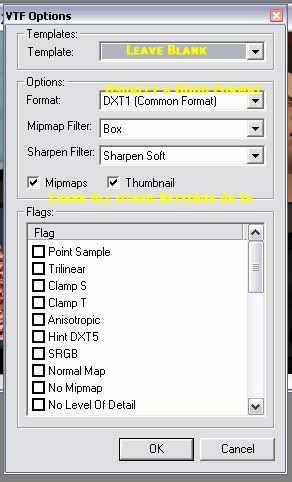 Then you need Photoshop (6.0 and above) with the .vtf plugin (download at http://nemesis.thewavelength.net/index.php?c=154). 3. To install the .vtf plugin, extract the files out of the .zip and follow the instructions inside the 'Readme'. MAKE SURE STEAM IS CLOSED BEFORE YOU DO THIS. 1. To extract the skins from the game, open up GCFScape. 2. 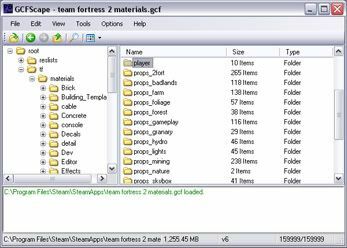 Then go to your SteamApps program folder (typically C:\Program Files\Steam\SteamApps), and open up the file "team fortress 2 materials". 3. Inside the .gcf, go into tf, into materials, into models. From here, if you want player skins, go into "player". If you want weapon skins, go into "weapons", then into "v_models". 4. Extract whatever skin (it will be a .vtf file) you want to anywhere you want, although I recommend creating a new folder on your desktop and extracting it there so you don't lose it. 1. Open up Photoshop (with the Plug-in installed), and open the .vtf file you chose earlier. 2. This is where your creative side comes in, Go Wild! Experiment a little using Photoshop's many features to get your desired effects. In my example skin, I gave the medic some baconpants! Make sure you keep your effects within the desired areas. ex. 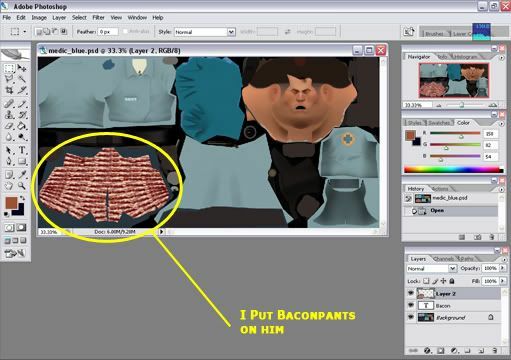 If you are doing a pants skin, like my medic, don't let the effects (bacon in this case) drift too far off the side. If you do, it may overlap a different section and come up in undesired areas of the skin. 3. When you are done, just save the new skin over the old one as a .vtf. 4. A new box will pop up asking you what settings to use, which you should not change. Just keep it as it is. IF YOU DO NOT SAVE IT AS A .VTF, IT WON'T WORK. 1. To apply a skin, you need to create a few folders to put it in. 2. First, create a folder on your desktop named "materials" (without quotes for all these). 3. Then, inside of that create a "models" folder. 4. Then, inside of "models" create either "weapons" or "player", depending on what you skinned. 5. If you made a player, create a folder inside of "player" with the name of the skin's class in all lowercase (ex. "scout") and put your player skin in there. If you made a weapon, create a folder inside of "weapons" named "v_models" and put your weapon skin in there. 6. 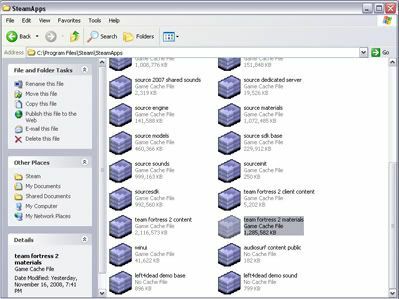 Once you are done making all these folders, open up "C:\Program Files\Steam\SteamApps\[yoursteamusername]\team fortress 2\tf" and move the "materials" folder into it with all the sub folders and skins inside. 7. When you are done making all these folders, the file extension should look like the one pictured below. Voila! You are Finished! This method can be adapted to many other steam games based off the source engine, including CS:S, CS:CZ, CS 1.6, and more. You just need to figure out where the skins are and where to put them once you are finished. -I, Google, do not take any credit in this. I only posted this because it was requested. As a skinner myself I might aswell add my two cents. I find this guide very nice and up to date. For anybody who does not want to get the VTF plug-in, I was taught to get VTFEdit which can also be used for quality sprays. 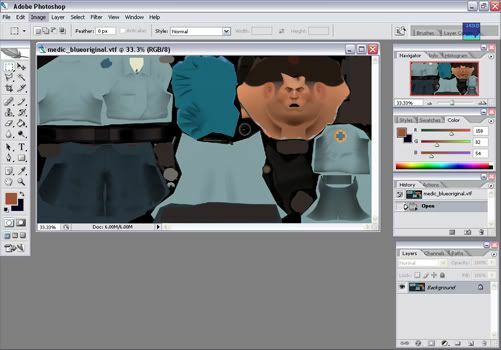 So you find the VTF files, you open them in VTFEdit and export them as JPG or w/e you want. Then you open those in photoshop, edit w/e you want, then import it back into VTFEdit and save it and go from there. You can also use VTFEdit for sprays. VTF files are the highest quality sprays in the game, so you could use this program for that too. Google wrote: MAKE SURE STEAM IS CLOSED BEFORE YOU DO THIS. Lol, why? I never close Steam when I do this. Seems to operate optimally. Idk , found this on fpabanana . Pics of the medic with bacon pants in-game?